Newport County Supporters Trust's bid to take over the club from lottery winner Les Scadding could take a major step forward on Wednesday. The Trust will meet with national fans' body Supporters Direct, which has been examining the League Two club's finances on its behalf. Euro Millions winner Scadding stepped down as chairman in June 2015. The majority shareholder's £1.25m investment helped Newport win promotion back to the Football League in 2013. But County narrowly missed out on a play-off place in 2014-15 and major shareholder Scadding is now willing to sell his shares at a reduced price. The 59-year-old wants to move to his holiday home in Barbados on a more permanent basis. Supporters Direct has completed its examination of County's finances on the Trust's behalf and will present the findings to the Trust's board on Wednesday. 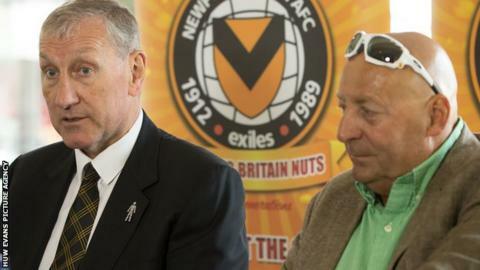 Newport also have a new manager for the coming season, with Terry Butcher having taken over in May. "It's disappointing with Les Scadding going, but he's got his own reasons for that and he's supported the club brilliantly in the past," said former England captain Butcher. "But it's not affected me at all. I know what I have to spend and I know what we have to do and we'll certainly work hard. "Players have shown a great willingness to come here, they really have. "Some players have made sacrifices in terms of taking lower wages to come to us."